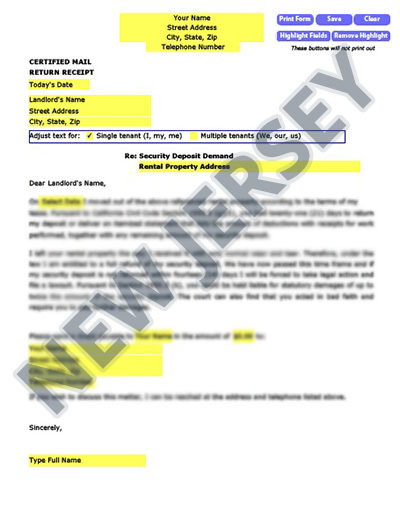 New Jersey tenants who have contacted the landlord requesting their security deposit but have failed to get the reimbursement should send this professionally written Security Demand Letter to warn the landlord. In accordance to the New Jersey laws, tenants must be refunded their security deposit within 30 days of leaving the rental property or be provided with an itemized list of deductions along with the amount left after deductions. The legal deductions are limited to unpaid rent, cleaning expenses if the premise is dirtier than it was before moving in and other damages beyond the inevitable wear and tear resulting from regular use of the property. The tenant can choose to employ the legal process to vindicate their rights and get back their withheld security deposit. However, it is a stressful and lengthy process following up with the court proceedings. A faster and easier way to get back the owed security deposit is to send a well-written demand letter that reminds the landlord that a legal action against them is your next move. A security deposit demand letter is the best way to get your security deposit outside court if sending a request letter and all other means have failed. A demand letter usually works well in prompting the landlord to repay the owed amount without the need to go to court. Downloading, filling and sending this letter takes just a few minutes, but delivers a firm warning to the landlord. Save a copy and send it through certified mail to get a return receipt. Our letters for New Jersey renters are tailored to your state, with the right laws to get your landlord’s attention. We’ve taken care of the Security Demand details so there’s no hassle on your part to find the right law and craft an approrpriate letter. Our letters have been used in New Jersey and all over America with great success.